The type of joint you use on your bridge can drastically change its strength. There are three basic types of joints, the Lap Joint, End Joint, and Notched Joint. To increase the strength of an end or notched joint you can add a Gusset. 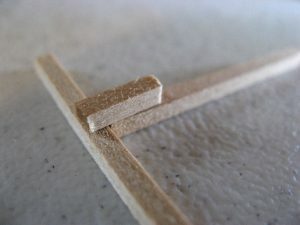 Learn about each type of joint and when to use it on a model bridge in this article. 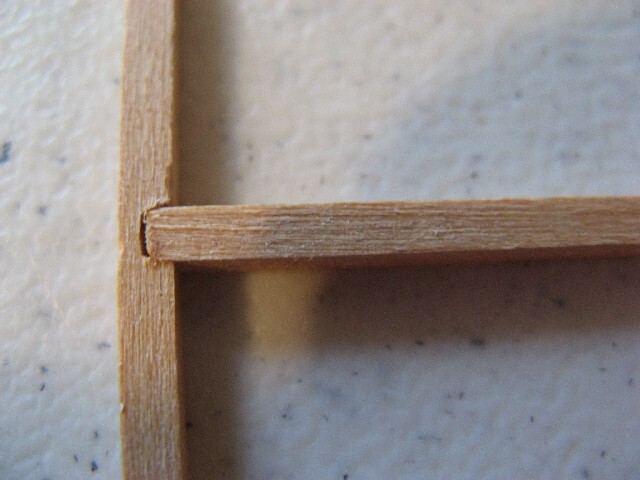 These pictures are not of glued joints, I simply laid sticks together. On a bridge, you want to make sure that the joints are clean and there are no gaps between the wood. Glue does not work well as a filler, the two pieces of wood should have no gaps. The lap joint is one of the strongest, and you should use it whenever you can. It helps members in compression to resist bending. The lap joint has a potential weakness, however. Depending on the type of glue you use, the joint is only as strong as the face of the wood. If your glue soaks into the wood then this will not be a problem. 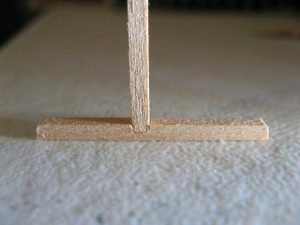 The face of Balsa wood is typically not strong, and tears easily. 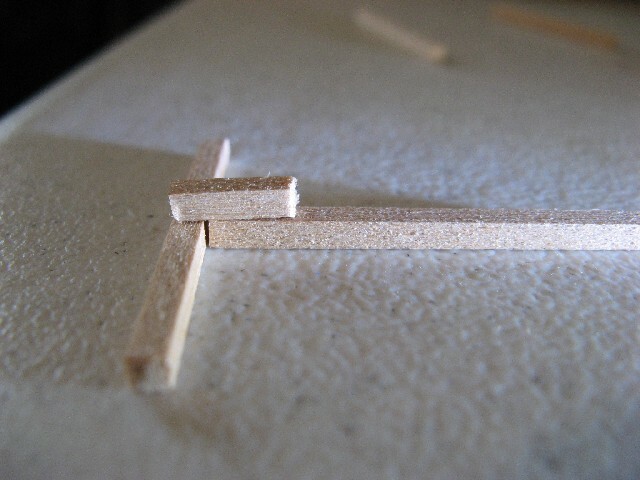 You can also help avoid tearing by making sure your lap joints have plenty of surface area for the glue. 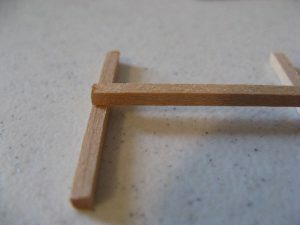 The end joint is not a very strong joint, especially for tension members. In tension, the two pieces of wood will just pull right away from each other. 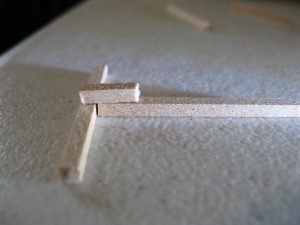 In compression, this joint will allow the piece to bend in a perfect arc. 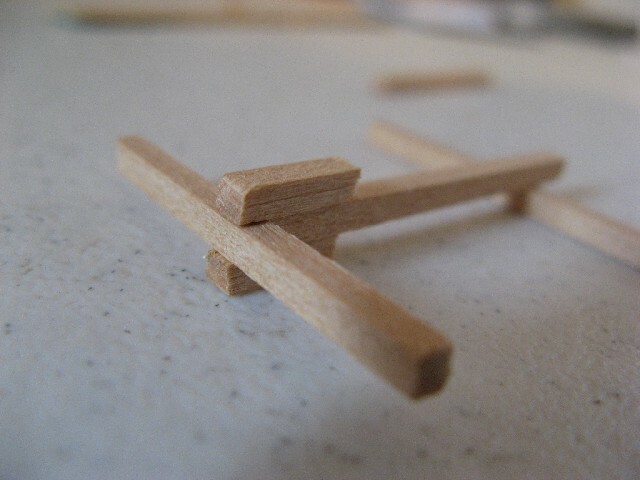 The lap joint holds the piece stiff, which does help it to hold more. The notched joint gives more strength than the end joint, but less than the lap joint. And if the notch is a little too big, it creates a weakness in the notched member. It is also more difficult to build, which makes it not very common. Sometimes it is impossible to avoid using an end joint on your bridge. But you can add a gusset to get all the benefits of a lap joint. 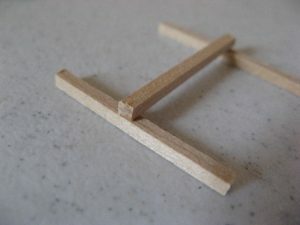 In fact, you can make two gussets to create the strongest joint possible. 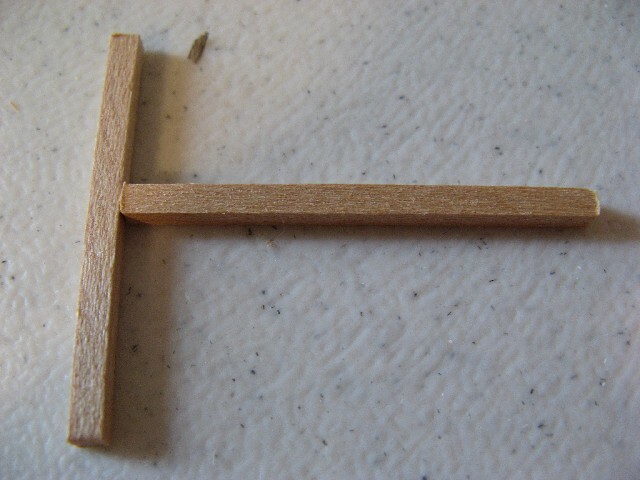 Typically gussets are thin pieces of wood, and not as thick as in these photos. 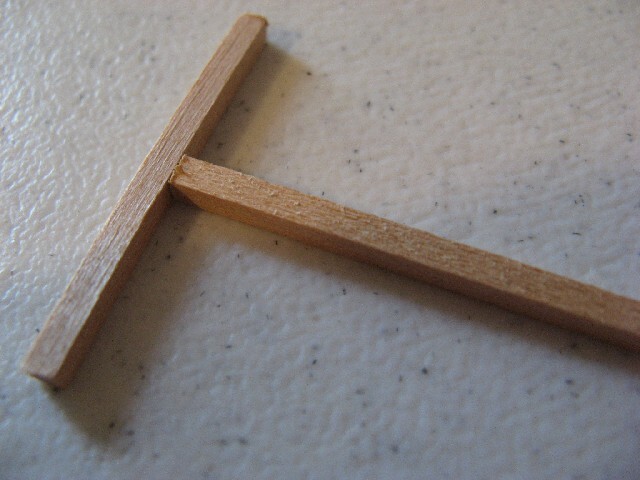 Again, I was simply throwing together some scrap sticks of wood to get these pictures. 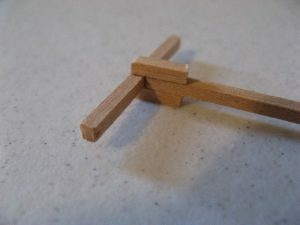 Hi, I have to make a popsicle stick bridge for my physics class, what is the strongest way to make a joint for an I-beam? We are not allowed to overlap the sticks. Thanks. hey everybody! another student that is doing the bridge prodject. any tips that you could give me? I’m writing a speech on our bridge that we did, and I was wondering why are double gussets the strongest bridge joints? For one of my engineering classes, we are currently building a bridge. We are allowed to use only 15 sticks of 3/23 x 3/32 x 24 inch basswood. The bridge cannot be less than 14 inches long or more than 16 inches wide. The main challenge is that the center of the bridge must allow a ¾ inch rod to pass through the center top of the bridge extending downward to the bridge deck. In addition, the continuous interior width of the structure must allow a 2 inch by 2 inch by 18 in clearance test block to pass through without obstruction from end to end. This ¾ inch loading rod will press down on the bridge deck testing block. I am thinking of designing a Pratt Truss. I have no experience in making bridges whatsoever, but I do love calculating joint member forces and etc. Any tips that can help me go in the right direction? Anything about designing the Pratt Truss and building it would be greatly appreciated. I wonder how many of us are using this as a source. Quite a few I believe. Thanks for this info. Now i can make a fantastic bridge for my technology project. Thanks again Garrett!!! Are you given wood to use or do you have to buy it on your own? The good news is that the shorter the bridge, the easier it is to get a high efficiency. I personally prefer the Pratt truss design. We are given the wood. How can I scale down the Fernbank Project-style bridge? It would be hard for you to build the Fernbank Project bridge. What made that bridge highly efficient was the use of T and L Beams, which are not allowed if I understand your rules correctly. Balsa wood can be tricky, as it is very inconsistent. Don’t think that you have to use all the wood, as it sounds like you do not have a minimum weight to hold. The lighter your bridge, the less it has to support to get a high efficiency. Pick out the best wood. I would recommend that you double your truss members by putting them on the inside as well as on the outside of your top and bottom chords. Also, if it is allowed, you might want to consider mixing a little water with your wood glue. I know it sounds weird, but it can actually strengthen your joints by thinning the glue just a little bit. Thinner glue can penetrate into the wood better. I’ve heard that a 30% water 70% glue mix works well. Make sure you have adequate lateral bracing and that your bridge is built so that it is perfectly vertical, and the sides are parallel to each other. Balsa bridges tend to break for two reasons, a member in compression fails, or the joints pull out. Typically the face of balsa wood is not very strong, which is why you want your glue to go deep into the wood. 56 queries in 0.572 seconds.